This dining set is a sophisticated update of a country classic. 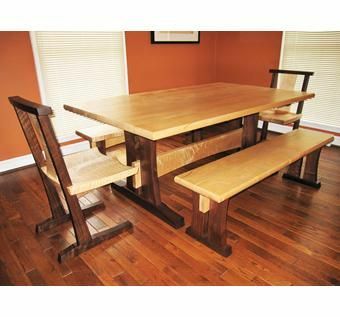 The table and chairs are made from hefty tiger maple and Oregon walnut timbers. 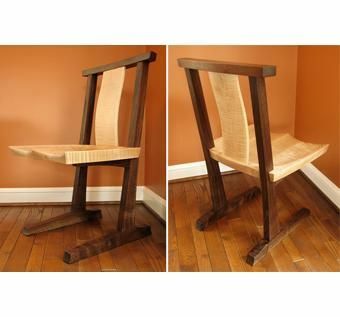 The cantilever chair is a dramatic design made extremely comfortable by a sculpted seat and ergonomic lumbar support. A pair of benches provide maximum seating for minimum cost. 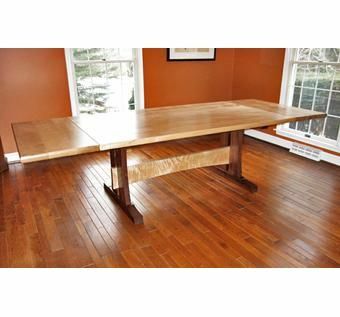 The table is 42" wide and 72" long with two 18" leaves for a total extended length of 9 feet, large enough to seat 12 people. Finished with a hand-rubbed oil/urethane blend.